The 1 - 6 with nothing to lose Jacksonville Jaguars played territorial Tom-Cat while hosting the 3 - 3 Miami Dolphins on week eight of the 2014 season. Jacksonville's NFL number two ranked in defensive sacks Jaguars put the Dolphin quarterback upon his buttocks once in each of his two first quarter possessions that went three and out. Miami's third touch of the ball was also a three and out, but at least quarterback Ryan Tannehill wasn't sacked due to an Offensive Lineman getting schooled. Jacksonville opened the game with 45 yards rushing on the first two plays from their own 20. They accrued fifty yards in all on five plays in two and a half minutes as Miami's defense forced a fourth and five field goal attempt from the Dolphins thirty yard line. The attempt was then blocked by rising star Olivier Vernon, gathered in at Miami's twenty five by defensive back Mike Thomas who returned it to the Dolphins forty three, and just missed by the width of his foot from taking it to the end zone. Following Miami's initial possession. Jacksonville took five minutes in covering forty six yards on eleven plays to Miami's twenty eight. On fourth and four the Jags made a forty six yard field goal that was nullified by an offensive holding penalty, and was inclined to punt on fourth and fourteen. The Dolphins were badly losing the game of field position after a second sack induced hot-potato like possession of three and out, this time from their own nine yard line. Jacksonville took possession one yard south into Miami territory, gathered a first down on four running plays for ten yards, and covered another sixteen yards on two eight yard passes to the Dolphins twenty three for another Jaguars first down to end the first quarter at zero to zero. 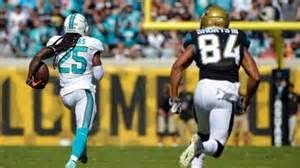 On the first play of the second quarter the Miami Dolphins free agent acquisition of Louis Delmas paid off with an interception return of eighty one yards, and a DOLPHIN PIK-SIX TOUCHDOWN for a 7 - 0 lead versus the Jaguars rookie quarterback sensation Blake Bortles. On fourteen plays for sixty six yards in another eight plus minutes of the second quarter the Jaguars drove to the Miami twelve where they kicked a field goal on fourth and two. Jacksonville accrued four first downs on the drive, ate up a whole bunch of clock, while the Dolphins reserve linebacker Jonathan Freeny managed a sack, and Miami remained ahead by a score of 7 - 3. As previously mentioned the Dolphins third (clearing of throat) series also resulted in another Miami offensive three and out, this time for minus four yards from their own twenty two yard line, and Jacksonville was back at the Dolphins forty with a first down after just one offensive play. On second and seven Blake Bortles scrambled for nine yards and a first down prior to Dolphin linebacker Jelani Jenkins forcing of a fumble that was recovered by safety Louis Delmas at the Miami twenty three. Hallelujah. The Miami Dolphins gain thirteen yards in two plays for their initial first down of the game with three minutes and twelve seconds remaining in the first half of play. Miami proceeds fifty two yards on eleven plays for a forty six yard field goal with fifty eight seconds remaining. Cam Wake sacked Bortles on first and ten of the Jags final first half possession, and the clock hits zero upon the completion of second down which results in a Dolphin 10 - 3 half time lead. The Jacksonville Jaguars hold a twelve plus minute Time Of Possession advantage, are up eleven to one in first downs gathered, and have accrued 219 Offensive yards to the Miami Dolphins fifty six. Blake Bortles (two sacks) goes 10 of 17 for 108 with a pik-six and a fumble as the Jaguar running backs contribute the other 100 plus yards. Ryan Tannehill while being hindered by (two sacks), and dropped balls as well as errant tosses under pressure is 5 of 12 for 41 yards with fourteen of Miami's fifteen rushing yards coming via his own two attempts. The Home team is winning in the trenches while losing on the scoreboard 10 - 3. Third Quarter, Miami gets the opening kick. New Game? Uh Nope. Maybe? Ryan completes a first and ten attempt for eleven yards to Jarvis Landry from the Miami twenty nine, but the possession is again stalled by a third down and long sack of Tannehill. The Dolphins punt from their own thirty and the Jags take control with a first down at their own seven yard line. Can you say Grimes To'Da'House? On first down Miami Cornerback Brent Grimes returns a Blake Bortles interception twenty two yards for a second M.D.House-Call, and another defensive TOUCHDOWN for a 17 - 3 Dolphin lead. The Jaguars from their own twenty progress down the field in ten plays for fifty eight yards to the Dolphin twenty two, and kick's a forty yard field goal on fourth and three to scratch their way to within 17 - 6. Miami then follows up with yet another three and out which is proceeded by a Jacksonville six and out of twelve yards gained. The Dolphins halted the Jags series via a Rashad Jones sack of Bortles on third and ten at the opponents forty nine yard line. Miami takes possession at their own five yard line upon the Jaguars punt. Lamar Miller nets three yards on two attempts, and on third and seven Ryan Tannehill completes a fifty yard pass (sixty-plus through the air) to Mike Wallace at the oppositions forty two. After an incompletion to Wallace on first down, Miller rushes for nine and thirty yards consecutively to the Jaguars three yard line. On first and goal Ryan Tannehill hits Rishard Matthews for the Dolphins only offensive TOUCHDOWN. The drive covered ninety five yards in seven plays and gave Miami a 24 - 6 scoreboard advantage with 2:18 remaining in the third quarter. The Jaguars go three and out as Miami starts the fourth quarter with a second down and ten from their own thirty two yard line. Daniel Thomas runs for eleven yards on two attempts, while Tannehill completes five of six passes for forty seven yards and a first and goal opportunity at the Jacksonville five yard line. At this point after driving sixty three yards in ten plays, the Miami offensive coordinator Bill Lazor put his quarterback in a position of failure with a call of a short middle pass that was deflected up at the line of scrimmage and intercepted in the End Zone. Sorry, but on first and goal from the opponents five yard line with a 24 - 6 fourth quarter lead you run the ball four times, or kick a field goal on the fourth play! You DO NOT call for a first down pass attempt through the trenches mass of waving arms! Aided by another third down sack of Bortles (via Terrance Fede) Miami's defense forced a six and out for eleven yards, and the Dolphins offense took control at their own twenty one after a Jaguars punt with 8:21 fourth quarter clicks to go. Tannehill went two of three for forty seven yards including a long thirty eight yard completion to Tight End Dion Sims, Lamar Miller rushed for nineteen yards on three carries, and Daniel Thomas had an attempt for seven yards. The possession covered sixty eight yards on nine plays in 4.5 minutes and resulted in a Caleb Sturgis field goal of twenty nine yards and a Miami Dolphins 27 - 6 lead with fewer than four game minutes remaining. Jacksonville went eighty yards in five plays and scored their only touchdown of the day in garbage time for a final score of DOLPHINS 27 to the JAGUARS 13. Miami rushed the ball for 133 second half yards to total 148 led by Lamar Millers 14 carries for 78 yards. Ryan Tannehill had five rush attempts for forty eight yards, and ended the day with 16 completions on 29 passes for 196 yards through the air with one touchdown and one interception. Miami narrowed down the twelve plus minute first half time of possession disadvantage to under five minutes, closed the 160 plus total yard first half deficit to 51 yards (377 to 326), and accrued 17 first downs to the Jags 19 by games end. The Dolphins defense sacked Bortles four times, forced him to fumble once, and took him To'Da'House twice. Thank You for an Open Minded Read, and we look forward to your angle of view :) !! The 4 - 3 Miami Dolphins host the 5 - 3 San Diego Chargers on week nine and will have to play far more efficiently on both offense and defense in order to have a chance at victory. Miami better get this win against the sub par Jaguars. Will Miami's undersized corners be able to take on Chicago's big receivers? Let's find out. With 59:54 ticked away, and a Dolphin lead of 24 to 20 achievements in the books. Ryan Tannehill's Miami Dolphins had outscored the Green Bay Packers and the NFL elite league leader in touchdowns thrown Aaron Rodgers. The Miami quarterback led his team on two of eighty, and one of seventy nine yard touchdown drives while the Packers had three eighty yard touchdown possessions. Green Bay gathered another eighty yards on two Field Goals for six points. On Miami's first touch of the ball Jarvis Landry had a 54 yard kick return to the Packer 49 yard line. The Dolphins gained 20 yards on five plays to kick a mid first quarter forty eight yard three pointer and pull within 3 - 7 after the Packers marched their opening possession for a touchdown. Green Bay gained fifteen yards to their own 25 on the following six play series and Miami's (Jonathan Freeney) blocked the punt for a (Chris McCain) recovery at the Packers 16 yard line. After six plays the Dolphins had a fourth and goal from the one yard line decision to consider. Kick a three point field goal for a one point late first quarter deficit, or go for the touchdown and a three point lead? Miami chose the latter with a rush attempt and was stuffed. Unfortunately. The score remained the same at 3 - 7 Packers. Following a Packer six and out Miami took possession at their own 27. A rush attempt for minus nine yards took place on first down. On third and twelve Tannehill threw a 20 yard pass that was intercepted and returned to the Miami 36 yard line. Green Bay covered 11 yards on six plays and kicked a 43 yard field goal for a 10 - 3 lead. The Dolphins went 3 & out which was followed by a Packer 6 & out for eleven yards. From Miami's 32 yard line on their next possession, and on their second first and ten play of the series, Tannehill threw a second interception to the Packers thirty two yard line. Green Bay went six and out for twenty yards. 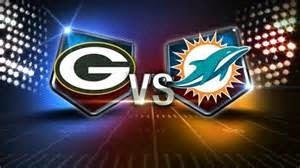 Miami followed with a six and out for 37 yards and the Packers ran one play to end the first half with a 10 - 3 lead. To open the third quarter Miami went eighty yards in five plays for a 10 - 10 tie, and first Ryan Tannehill to Jarvis Landry TOUCHDOWN! The touchdown was of eleven yards, forty yards and half of the drives eighty came from a single Ryan Tannehill sprint. Green Bay returned the favor of eighty yards on 13 plays and seven points to retake a 17 - 10 lead. With 3:44 remaining in the third quarter Miami again responded with another eighty yard, ten play, five minute touchdown drive to tie it at 17 - 17 early in the fourth quarter. In this series Tannehill completed passes of 25 yards to Mike Wallace, and 14 yards to newly re-acquired receiver Damian Williams while Lamar Miller ran for forty three yards on six carries including a five yard TOUCHDOWN! 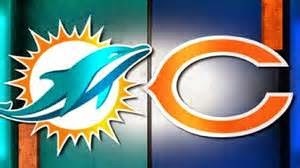 After another Packer three and out it's the Dolphins ball at their own 21 with 12:34 remaining. This drive included first down pass plays of 25 yards to Wallace, and 21 yards to Jarvis Landry as well as a third and two 20 yard pass play to Lamar Miller. Six plays, and seventy nine yards later Ryan Tannehill throws a five yard TOUCHDOWN to Mike Wallace, and the Miami Dolphins lead the Green Bay Packers by a score of 24 - 17. The Packers pulled within 24 - 20 after gaining 68 yards for a 30 yard field goal with four minutes and nine seconds remaining. Miami ball at the Dolphin twenty. Second and ten, Tannehill to Landry for eleven yards and a first down. Second and eleven (illegal hands to the face) and "another Miami Dolphins first down" at the 36. A one yard run on first down, and a second down incompletion leads to a Dolphin third and nine yards for a first down. With zero Packer timeouts remaining. The Dolphins elected to conservatively run the ball from their own 36 on a third and nine at the three minute mark of the fourth quarter. The rush attempt went for one yard and Miami punted possession of the ball away to Aaron Rodgers from his own forty yard line with two minutes and four seconds remaining. Need more be said? Though several Miami Dolphin defensive drive halting, and/or the running out of the clock opportunities were there for the taking. The Green Bay Packers Aaron Rodgers attained victory over Ryan Tannehill and the Miami Dolphins with three seconds remaining by a score of 27 - 24. Green Bay won the turnover battle (3-0), had a 14 plus minute time of possession advantage, ran 24 more plays, and accrued a total of just 20 more yards (split via the run/pass) than Miami's total of 349 offensive yards gained (112 rush and 237 pass). Can Miami make it to 3-2? We'll see this week against Green Bay.